Aside from a few rail trips that have passed through, I have seen little of Berlin outside of the Hauptbahnhof. I felt that it was a shame not to stop to see more on those visits, and I resolved to do just that on this occasion. Travelling to the Island of Usedom for the Usedomer Musikfest involved flights in and out of Berlin Tegel, so it seemed logical to extend my trip slightly (at no additional cost to the orchestra) to be able to absorb some of the city and in particular, to visit the Berlin Musical Instrument Museum. 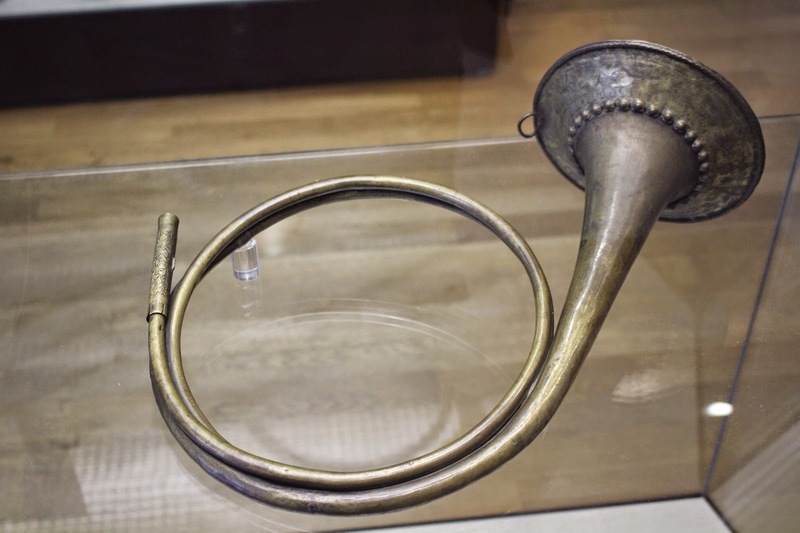 I was particularly interested in seeing the Huns Veit trumpets and the Georg Friedrich Steinme[t]z horns housed there, as I own replicas of these instruments and I had never seen the originals. I had a room booked through Airbnb. I stayed in a room in a flat on the 4th floor of Alte-Moabit, which is quite close to the Hauptbahnhof. The room was excellent value. It was clean, I had my own bathroom and the delightful host was very kind in allowing me to arrive early on the Monday morning and to leave late on the Tuesday afternoon. This was perfect for me as it meant I didn't have the worry of transporting my luggage before my check-in or out. The central location was ideal and I set off on foot exploring the city, which I did at about 10:40am. Firstly, I wandered through the Tiergarten, heading Westward from the Paulstraße bridge. I was so excited to visit the Brandenburg Gate. It is one of those structures, like Big Ben or the Eiffel Tower that has become so iconic and synonymous with the city of its location. The Brandenburg Gate also became hugely famous with its association with the Berlin Wall, as the wall ran so close to this impressive structure. The Brandenburg Gate is at the end of 'Unter den Linden'; the long, straight, tree-lined street that spans the city centre, connecting the municipal and significant buildings of Berlin together like a wide cultural artery. Before arriving at the Brandenburg Gate, I made a short stop at the Reichstag building. I was impressed by its sheer scale, and the crisp, rich colours of the huge German flags flying proudly at each corner of this imposing building. After my brief visit to the Reichstag I finally walked the final 500 metres or so toward the Brandenburg Gate. I was suitably impressed by the Brandenburg Gate, and at that time in the morning there was hardly anyone there. I took a few photos, and walked further down Unter den Linden in order to get a full view of it. Carrying on further down 'Unter den Linden' (and deviating from it occasionally whenever curiosity struck) I came to the grand 'Museums Island' and took some photographs of the impressive buildings there, as well as the main Cathedral and the passing river boats. I had decided not to go to any museums today (Monday) as I wanted to remain mentally fresh for the visit to the Musical Instrument Museum on Tuesday. I didn't want to suffer from what I call 'culture fatigue'. I had eaten lunch in a pizza restaurant: I must have been in and out of there within 20 minutes. Without museum-browsing or leisurely dining arrangements, I had a good amount of time to see Berlin itself. I walked as far as the Alexanderplatz and explored a little in that area, taking a moment to look at the recently-released iPhone 6 in a shop there. I returned, more-or-less the way I came but on the other side of the road. I stopped to admire the Neptune Fountain and the Marienkirche in the shadow of the recognisably bulbous Berliner Fernsehturm (TV Tower). Travelling by the U-bahn (Underground), I arrived at a station called Stadtmitte. From there I had decided to walk down to Checkpoint Charlie to see what was there. Having visited the East German checkpoint in Duderstadt (while working in nearby Göttingen earlier this year), I knew vaguely what to expect, but somehow it seemed to be more of a bizarre idea to have a border in the middle of a city. I found it fascinating, and found myself wondering how much of Checkpoint Charlie is unchanged and how much of it has been resurrected or even constructed for the tourists. There was an exhibition on hoarding boards on the approach to the checkpoint, on the way down Friedrichstraße. The exhibition had well-chosen extracts (with excellent English translations) and old photographs which showed the checkpoint how it was during the Cold War. I enjoyed reading about its history, and consciously decided to read this and only this, after all... this was sort-of bending my rule about avoiding museums today. But as it was outside, I felt that it was acceptable. After more wandering, I returned to the Brandenburg Gate. Now, much later in the day (about 4:30pm) I found hundreds of tourists, several horse-drawn carriages queuing and a man playing the barrel organ at the Brandenburg Gate. I think I preferred it in the early morning though the evening sunshine was catching the stonework and illuminating it attractively, so I stopped to take some more photos of it. After this, I decided to walk along the Straße des 17 Juni as far as the Siegessäule (Victory Column). It was a really long way along the street up to the Victory Coloumn, which didn't seem to be getting any closer. I was exhausted and my soles of my shoes were wearing thin. I eventually got to the Victory Column and I paid €3 to climb it. Inside, there was a museum (I'd been duped into going into a museum). Anyway, the museum was brief and I climbed the 300-odd steps to the top of the tower. The view was good, but there were rather too many people up there to be able to see much. It was also very windy and it looked like it was going to rain. It was around 6pm and I was exhausted after almost continuous walking since 10:40am, so I decided to leave the Siegessäule and walk back up the Paulstraße to Alte-Moabit, ready for an early night. I added some photos to my Facebook wall and several friends offered ideas for where else I should visit in Berlin. Next morning, I decided to go to Warschauer Straße. Warschauer Straße is a station on the East side of Berlin. I travelled there by S-Bahn from the main station. I had a walk around the area next to the almost-deserted Cassiopeia club, which must be very busy in the evenings, but it was deserted at 11am. The whole complex is alongside the railway and the buildings seem to be old goods warehouses which have found an alternative lease of life as street-food stalls, skating halls, climbing facilities and bars - all packed in this urban, graffiti-filled paradise. After my brief visit to Warschauer Straße, I set off on the underground railway to the Musical Instrument Museum. As you'd expect in Germany, the museum is located next to the Philharmonic Hall within the Kulturforum. Everything is wonderfully planned and designed. The building is obviously purpose-built (as it encompasses the Wurlitzer Organ so seamlessly) and it is an excellent facility. Upon my arrival, my eyes were drawn immediately to the Huns Veit trumpets. I examined them through the glass and started taking hundreds of photographs from various angles, trying to eliminate the glare. 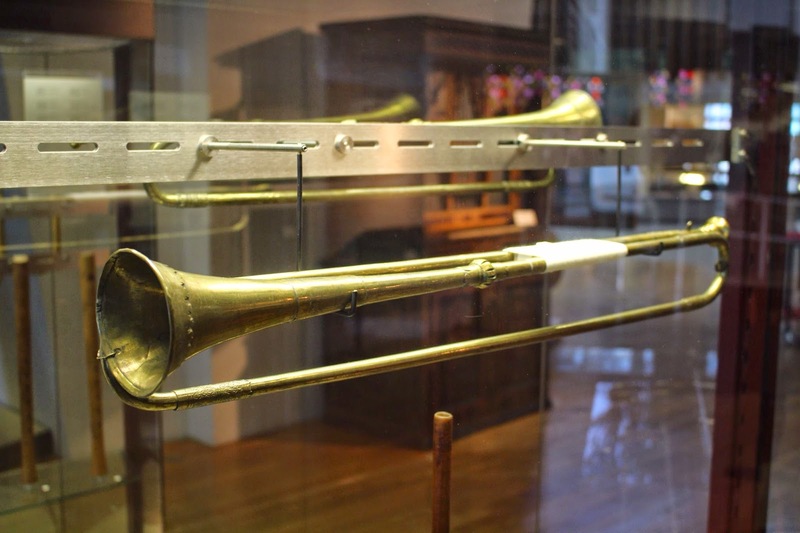 The Veit trumpets are interesting in that one is a slide trumpet and the other is not, but they are clearly from the same maker and from the same mandrel. One of the instruments is from 1646 (in C) and the other from 1651 (Zugtrompete in D). Sadly the slide was lost during World War II. Both were from the Wenzelskirche in Naumburg, and acquired by the museum in 1890. 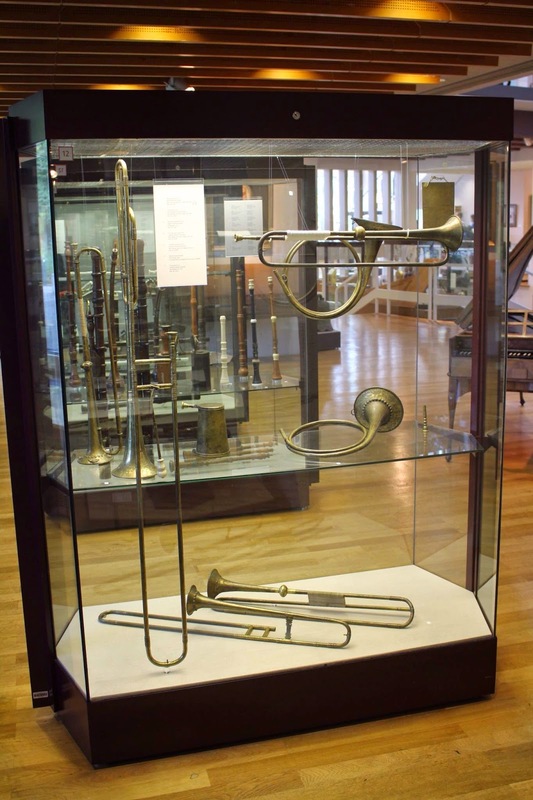 The next cabinet to attract my attention was one with the two Steinme[t]z horns, an Ehe Trumpet and an F trumpet by Michael Hainlein (Nürnberg, 1697). 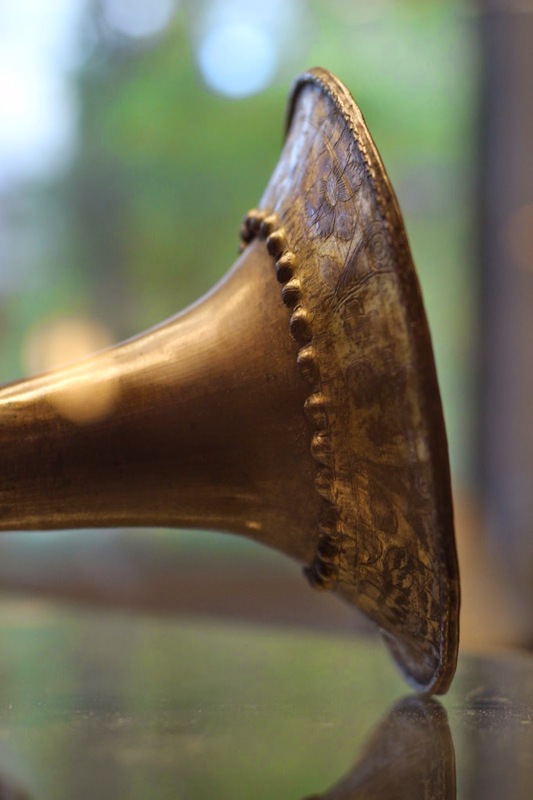 I concentrated my efforts in studying and taking photographs of the Steinme[t]z horns, as I have a copy of this instrument. 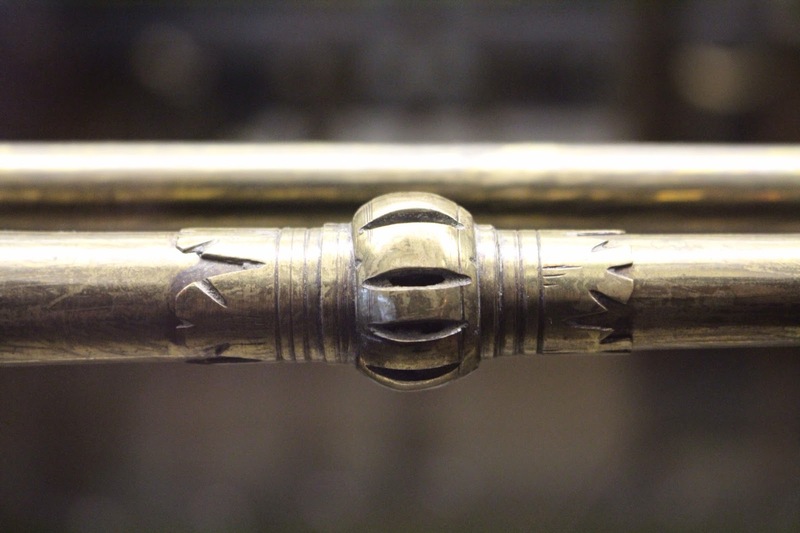 One of my favourite exhibits at the museum was an original engraving of all of the trumpet and horn makers' marks on one sheet of brass. 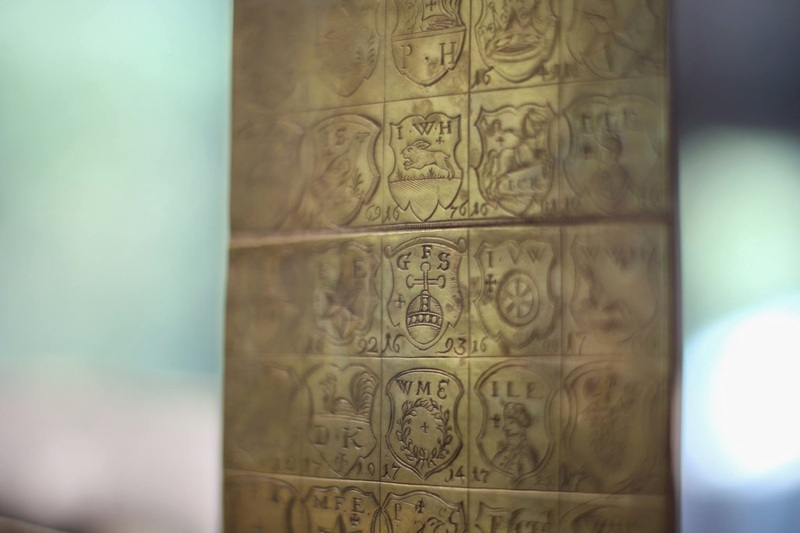 I used my Canon 50mm f/1.4 lens to get the G F S from Georg Freidrich Steinme[t]z in focus. I had arranged to meet Johann Plietzsch in the afternoon, after he finished at a rehearsal. We had lunch in the Museum cafe and we looked at the collection together afterwards. I left the museum at around 3:30pm, after purchasing the Katalog der Blechblasinstrumente and another, more recent book entitled Valve Brass Music. Having realised the time, I needed to get back to pick up my case before leaving Berlin. I took a bus to Tegel Airport. There was a lot of traffic, but I got there in good time despite that. The airport is refreshingly simple: the bag drop, gate and security are all in the same place. If only all airports could be this simple! I had a marvellous trip to Berlin, and if you haven't been before - I highly recommend it.